Remember the days before iPhones and iPads when video games had actual physical controllers? Handheld gaming systems like the Nintendo DS and PSP aside, most of us do our casual gaming on our phones, iPads or Kindles these days. The iMpulse is a nifty little Bluetooth device that lends some physical buttons to your virtual gaming platform while also doing some other pretty handy things. 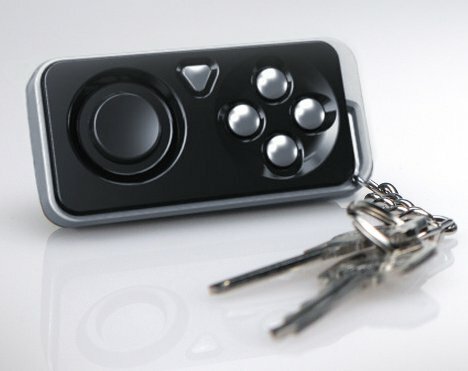 In addition to giving you physical forward, backward, play, pause, mute, navigation and volume controls, the iMpulse attaches to your key ring and acts as a finder for lost keys. It only works when you (and your phone) are near enough to your keys for the Bluetooth connection to function, but at least it’s better than having no help in finding those lost keys. The iMpulse also works as a remote shutter button for your phone’s camera. But its primary function is to work as a game controller, either alone or connected to others for a multi-player game. It isn’t the only device of its kind out there, but it’s small and portable enough to take anywhere with you. The project is set to be funded through Kickstarter, and once it’s available commercially will retail for somewhere around $40.